Published on 02. 09. 2012 in comics and cartooning, current affairs, film, tv, video and hype & linkage. 5 Comments Tags: Barack Obama, Dark Knight Rises, Derik Badman, Henry Sørensen, Jack Kirby, Jane Meyer, Matt Taibbi, Mitt Romney, Morten Søndergård, Paul Ryan, R. Fiore, RNC, Sheldon Adelson, Spider-Man, US Presidential Elections. Watching (selected parts of) the Republican National Convention this past week has accentuated the distinct feeling that we have been witnessing a gradual dismantling of democracy in America over the past fifteen years or so. The nadir so far was still the stolen election in 2000, closely followed by the disgraceful first election of George W. Bush on the backs of a vulnerable minority in 2004. However, the political deadlock in Congress for the past four years has been a dismaying spectacle to say the least, as has the Obama administration’s utter failure to correct the political abuses of its predecessors in its foreign policy. And now we’re getting myth-making on a grand scale, with bald-faced lying and deception the order of the day for the Republican candidacy. Romney seems to be the ultimate candidate of this particular moment in time. Entirely malleable in his effort to reach the majority that will win him the election, he is now running along with a right-wing ideologue whose approach to facts as something equally malleable was made apparent in his address on Wednesday. And with the Citizens United decision by the Supreme Court in 2010, the stage is set not only for the mass propagation of these lies, but the further marginalization of the greater electorate. I know, politicians have always lied and American politics have long been dependent on special interest, it just seems to me that we are witnessing an accelerated decline these years. For all its disappointment, the Obama administration have achieved — or seemed to achieve — a few important victories for democracy, from ending Don’t Ask, Don’t Tell to fledgling universal health care, but overall the prospects that the fundamental problems of the system by which they rule, starting with its dependence on big money, will be solved are bleaker than ever. This election will not even carry the entertainment value of the last one, it’ll just be depressing, but it will also be a real test of a severely tested democratic system. Jane Meyer at the New Yorker has written about the Obama administration’s relationship to its donors and the general dependence of American politicians on same, past Citizens United. Tying into this, this 2008 profile of casino mogul Sheldon Adelson, one of Romney’s chief donors, is an illuminating read. Last, but not least, Matt Taibbi has written about Romney’s time at Bain Capital at Roling Stone. 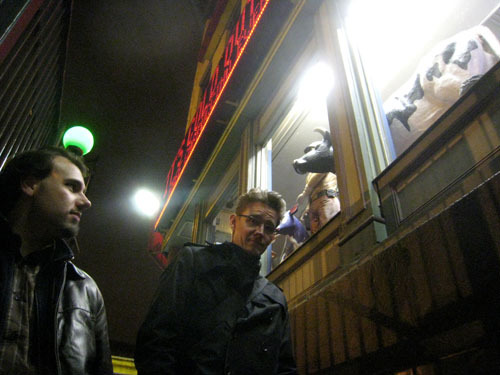 Comics: R. Fiore on The Dark Knight Rises, Craig Fischer on Jack Kirby, Derik Badman on comics poetry, Dan Nadel on Mazzucchelli and Miller, Henry Sørensen and Morten Søndergård on fifty years of Spider-Man (Danish alert!). Published on 23. 02. 2011 in journal. Closed Tags: Derik Badman, Meta. 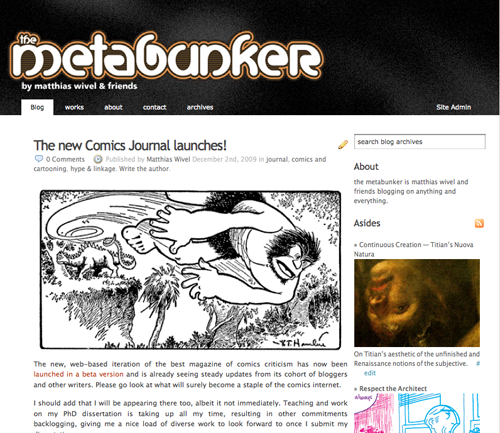 As you may have noticed, the Metabunker now looks slightly different from how it did until last week. The simple reason is that we’ve finally shed the coils of our 2007 WordPress installation (see image for a reminder) in favour of something a little more 2011. A huge thank you to Derik Badman for mastering the transition. Without him it probably wouldn’t have happened for another four years, if at all. So, it is now easier to sign up for our RSS feed — just tap the switches on the upper right of the sidebar. Other than that, we’ve decided finally to activate our dormant Twitter account as an experiment, in order to see whether that particular piece of hyped online ephemera is going to cause any revolutions in our neck of the woods. We ain’t asking for much — a little fun will do — so we might just be pleasantly surprised. Please note, however, that we haven’t yet managed to set up a mechanism to hype updates made here directly in that succinct format, but it may happen sometime soon! In any case, we hope that you’ll keep reading and find something to enjoy. There’s always stuff in the pipeline. Let us know what you think!